Are any good products still made in America? Conventional wisdom says U.S. companies have shuttered their factories and moved manufacturing abroad for cheap labor. During the recession, 2 million manufacturing jobs vanished. Here's the story you don't hear: The United States is still the world's largest manufacturing economy, producing $1.6 trillion of goods each year, or 21 percent of global production. And that number may rise as more companies move back to the United States in search of lower costs and higher quality. The United States will experience a manufacturing renaissance within the next five years, predicts the Boston Consulting Group. Increases in Chinese wages and shipping costs, as well as subpar manufacturing quality overseas, have already inspired some companies to consider "onshoring" or "reshoring" their production efforts back to the United States. And as U.S.-based industrial giants such as General Electric (GE) and Caterpillar (CAT) make the switch today, thousands of smaller companies continue to churn out best-in-class products across the country. We're celebrating 10 American companies making signature consumer products with American ingenuity - and leaving foreign-made competitions in the dust. This article was updated on July 1, 2011. If you're cooking with gas or charcoal this summer, odds are you'll throw steaks on a Weber grill. The company attributes its success to the fact that its iconic charcoal-grill kettle design hasn't changed shape since the grill was created in 1952. Food just seems to cook better. Why tinker with success? The rest of its line is also high quality: Consumer Reports gives Weber top marks for mid-size gas grills and Good Housekeeping would splurge on a top-of-the-line Weber. 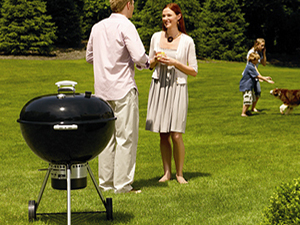 Consumers seem to agree, making Weber the global industry's leading manufacturer in dollar share of sales. Although Weber does produce two inexpensive gas models in oversea, all other grills, including all its flagship charcoal models, are made in Illinois. Says Executive Vice President Mike Kempster, "We're proud to be an American company." Company HQ: Palo Alto, Calif.
What's green, goes from 0 to 60 in 3.7 seconds and eats a Prius for lunch? The Tesla (TSLA) Roadster electric sports car. At $101,500 after the federal tax rebate, this is not a car for soccer moms. The first new American car company since DeLorean, Tesla brings together Americans' love of expensive toys, Silicon Valley cool and environmental friendliness. While the Chevy (GM) Volt is expected to deliver about 40 miles between charges and the Nissan Leaf claims 100, Tesla drivers are getting 245-plus miles from its battery technology. As is only appropriate for a company just north of Palo Alto, the stock popped 42 percent on the day of its IPO last year, when it became the first American car company to go public since the Ford family issued common stock in 1956. The Roadster's body is made in England and shipped here for assembly with the U.S.-made powertrain. Tesla's 2012 Model S sedan will be built entirely in the United States - and will be a little more affordable at $49,900. During the Internet boom, Herman Miller's (MLHR) sleek Aeron desk chair, pictured above, was the ultimate start-up status symbol. It was not only ergonomic and adjustable, the Aeron was distinctive enough to frame and hang on the wall. Since then, the company has continued dominating its market by combining clever design and functionality. In fact, the Museum of Modern Design in New York has featured more than 50 Herman Miller designs, including its chairs. Lean manufacturing allows the company to produce a built-to-order Aeron chair (in any of 10 million different configurations) every 16 seconds, mainly at their two plants in Western Michigan. And while North American domestic sales account for approximately 70 percent of Herman Miller's business, the company sells its chairs in 140 countries and on all seven continents -- including an ice station in Antarctica. Walking into an Earnest Sewn retail store, you may feel like you've been transported to the Wild West in the late 1800s. Designed as old general stores, the stores' Americana aesthetic is a testament to the young company's economic patriotism. Not only are Earnest Sewn jeans sewn in the United States, but they are also designed, washed, finished, and shipped in Los Angeles. According to Kearstin Nuckle, Earnest Sewn's creative director for men's and women's denim, LA is home to the most innovative concepts and the best laundries in the world for denim wash. For premium denim like Earnest Sewn (their jeans retail between $165 and $230 a pair), such high caliber is necessary to satisfy the customer. "When they're spending $200, they're expecting to be buying a pair of jeans made in the United States," Nuckle says of her customers. And while lower grade jeans are still made inexpensively overseas, Nuckle sees the trend of American manufacturing spreading to mid-tier jean companies (such as the Gap (GPS)) as they also aim for higher quality products. When the Hobart Manufacturing Company sent its new mixer home with its executives for testing in 1915, one executive's wife said, "I don't care what you call it, this is the best kitchen aid I ever had." Four years later, the brand KitchenAid emerged, taking the home appliance market by storm worldwide. For nearly a century, the mixer has remained at the core of KitchenAid's success. "Our mixer is iconic," said Deb O'Connor, senior manager for the brand experience at KitchenAid. "And it's an All-American product." KitchenAid mixers are all still made at the company's main plant in Greenville, Ohio. Mixing enthusiasts can even watch the manufacturing process unfold at what O'Connor describes as "the prettiest plant you'll ever see" thanks to the mixers' bright and varied colors. In the early '80s, Harley-Davidson (HOG) was choking on the exhaust of cheaper foreign-made motorcycles. Today, Harley is the No. 1 seller of heavyweight motorcycles in the U.S., producing more than 220,000 bikes with (roaring) engines of 650 CCs or larger. Credit the turnaround to Harley's revved-up focus on engineering and manufacturing, while remaining true to its biker heritage. Says spokesman Bob Klein: "Harley's American roots resonate around the world." You could buy a warehouse full of Kenmores for the price of a single Viking Range, which will run you anywhere from $4,000 to $13,000. Viking's gas ranges created a new niche: before they came along, the serious gourmet had to buy a commercial stove if she wanted to cook on gas at home. Now, chef-style gas ranges are all the rage among gourmands and Food Network fanatics. Viking has stayed on top by combining cooking technology with style and the Toyota Manufacturing Process in its plant, meaning products are only made after they are ordered. "We are not an appliance manufacturer," says Viking founder Fred Carl. "We are a culinary company and we design products for culinary people. There is a difference." Company HQ: Port Washington, Wis.
All but two percent of shoes sold in America are made overseas, so how does Allen Edmonds keep a toehold here? The company, which bills itself as the great American shoe company, has carved out a niche making beloved, hand-stitched, high-end men's dress shoes domestically since 1922. Each shoe goes through 212 painstaking steps, like sewing the sole on from the outside for extra comfort. With due respect to Zappos, Allen Edmonds services shoe buyers like no other U.S. shoemaker. Some of its master fitters have fitted more than 100,000 customers; shoes are available in widths from AAA to EEEE; and the company routinely recrafts shoes originally sold in the 1970s and '80s, providing customers with digital before-and-after photos and a video of the process. Company HQ: Mill Valley, Calif. In 2007, Fisher-Price (MAT) recalled one million toys due to toxic lead paints used by the company's Chinese manufacturers. That same year, Robert von Goeben and Laurie Hymen founded Green Toys, whose products are made entirely from recycled plastic milk jugs. With the top-selling eco-friendly toys on Amazon.com (AMZN), Green Toys is a leader in environmental toy manufacturing, a burgeoning industry that's growing more than twice as fast as the broader toy market. Every step of the Green Toys manufacturing process, from recycling to manufacturing, takes place in California. Green Toys actually welcomes the Golden State's strict safety and environmental laws, and attributes its success, especially outside the United States, to the fact that everyone knows they are subject to strict oversight. "We have customers overseas that have told us they buy our American-made products because they know they're safe," says Goeben. "And for parents, safety trumps all." Company HQ: Delray Beach, Fla.
More records have been set using hand-assembled Tibor Reels -- the favorite fly-fishing reels of both President Bushes -- than any other in salt or fresh water. According to the International Game Fish Association, Tibor Reels holds more than 800 world records to date. Every inch of the reel, which has a lifetime warranty, is made in the U.S., mostly in the company's 25,000-square-foot factory headquarters. Says Mariane Juracsik-Papa, vice president and daughter of founder Tibor Juracsik: "We have people who have been using Tibor reels for 35 years." Nice catch.